Railtown Catering recently launched their fall-winter menu and it looks absolutely divine. 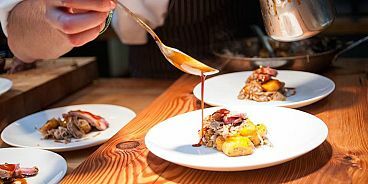 Chef Dan Olson, who cooks using classical French techniques, is inspired by local ingredients, and his new menu was designed with a balance of rustic comfort and finesse. Think marinated mushroom toasts with local camembert and chives, steak tartare with grainy mustard on grilled mini baguette and poached quail egg with black truffle oil and pumpernickel. Customized décor, floral arrangements and entertainment are also available through Railtown Catering. This passionate local company is all about going above and beyond to create memorable, truly personalized events. To better assist with your various event needs, they’ve established great relationships with many of Vancouver’s preferred industry vendors. In other news from Railtown Cafe, they’ve just launched their own line of hand-made ice creams that you can find at their Railway Street location.